The Mercury Balloon eperiment was a tethered balloon subsatellite carried on two Mercury missions. The objectives of the balloon experiment were to measure the drag and to provide visibility data regarding an object of known size and shape in orbital space. The balloon was 30 inches in diameter, and was constructed of five equal-sized lunes of selected colors and surface finishes The sphere was constructed of a plastic and aluminum foil sandwich material, and was to be inflated with a small nitrogen bottle immediately after release from the antenna canister at the end of the first orbital pass. In addition, numerous 1/4-inch discs of aluminized plastic were placed in the folds of the balloon and dispersed when the balloon was deployed. As intended, the pilot observed the rate of dispersion and the associated visual effects of the "confetti." On the first mssion with Mercury MA-7, the balloon was deployed at 01:38:00 ground elapsed time, but it failed to inflate properly. The cause has been attributed to a ruptured seam in the skin. Aerodynamic measurements were taken with the strain-gage pickup, but these are of little use since the actual frontal area of the partial inflated balloon is not known. The visibility portion of the experiment was also only partially successful because only two of the surface colors were visible, the orange and aluminum segments. While the balloon was deployed a series of spacecraft maneuvers evidently fouled the tethering line on the destabilizing flap located on the end of the cylindrical portion of the spacecraft, thus preventing the jettisoning of the balloon. No difficulty was encountered during retrofire and the balloon burned up during reentry. A second balloon experiemnt was carried on Mercury MA-9. On the sixth orbit, after nine hours in space, the astronaut set his cameras, attitude, and switches to deploy a tethered balloon, for aerodynamic studies of drag and for more visual experiments. 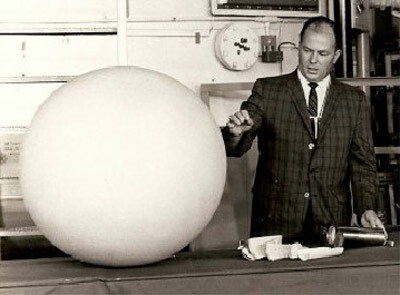 The balloon, a 30-inch-diameter Mylar sphere painted fluorescent orange, was to be inflated with nitrogen and attached by a 100-foot nylon line to the spacecraft antenna canister; a strain gauge in the canister should be able to measure the differences in pull on the balloon at apogee (166 miles) and perigee (100 miles). Cooper carefully went through his checklist, then tried to eject the balloon package, but nothing happened. He tried again, and still nothing happened. Because the antenna canister was later lost, no one ever knew why the tethered balloon failed to eject.